Acrok Video Converter for Mac is specially designed for Mac users to convert almost all video and audio formats from one to another, including MOV, MP4, M4V, AVI, WMV, MKV, MPG, TiVo, MTS, M2TS, MXF, RM, RMVB, FLV, etc. With this Video Converter software for Mac, you can enjoy your favorite video on almost all popular portable devices anywhere and anytime, like iPad, iPhone, iPod, Apple TV, Galaxy Tab, Samsung Galaxy S4, Kindle Fire, and more. Click the Add Files button on the main interface to load video or audio files from your computer or other devices like USB device, camcorder, etc. 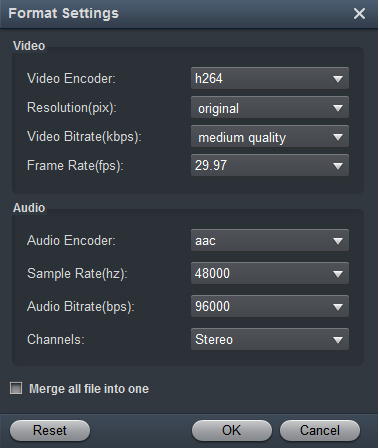 You can also directly drag the files you want to convert to the Acrok Video Converter for Mac main interface. Batch conversion is supported by this software, so you can add several files as you like at one time. Click the "Format" drop-down menu to choose an output format that you prefer. Acrok Video Converter can convert video to various video formats like M4V, MP4, MOV, MKV, AVI, FLV, WMV, 3GP, etc. For playing movies on Panasonic Virea TV, Samsung Smart TV, Sony HDTV etc. Acrok Vdieo Converter can give you a hand. Tip 1. How to edit video Before converting your video files, you can click Edit to personalize and touch up your videos in clicks. 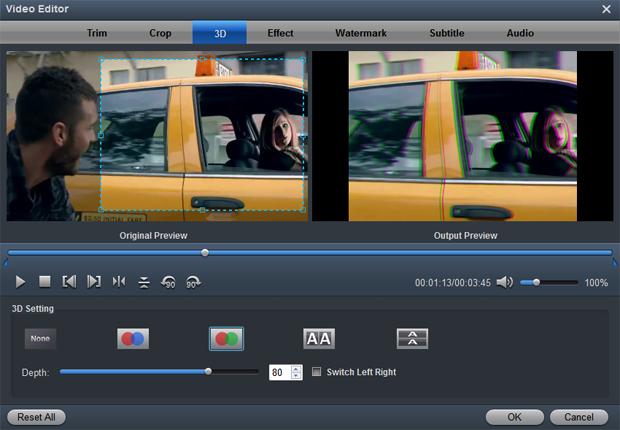 Video editing functions like Trim, Crop, Effect, 3D, Watermark, Audio and Subtitles are provided. Tip 2. How to play videos Acrok Video Converter for Mac also acts as a perfect media player that lets you play videos in various formats. After loading the files, click the Play button the software will play your videos smoothly. While playing, you can take snapshots of your favorite movie scenes, enjoy fullscreen view, convert files, etc. as you like. 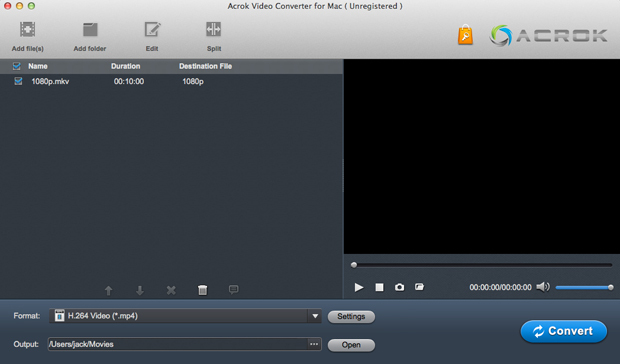 Tip 3: If you want to convert Audio files via Acrok Video Converter for Mac. Just drag any music into this program, then choose a output audio format from "Common Audio" category. Acrok Vdieo Converter for Mac can help you convert *.au, *.mp3, *.mp2, *.flac, *.ape, *.ogg, *.8svx, *.aiff,*.aif, *.caf, *.dts, *.smv, *.tta, *.voc to MP3, AAC, FLAC, MKA (MKA(Matroska) Audio), OGG (Ogg Vorbis Audio), WAV(Nokia WAV Audio), M4A (Nokia M4A Audio) Format.